The octanol/water partition coefficient (Kow) is defined as the ratio of a chemical's concentration in the octanol phase to its concentration in the aqueous phase of a two-phase octanol/water system. Values of Kow are thus, unitless. The parameter is measured using low solute concentrations, where Kow is a very weak function of solute concentration. Values of Kow are usually measured at room temperature (20 or 25'C. The effect of temperature on Kow is not great - usually on the order of 0.001 to 0.01 Iog Kow units per degree - and may be either positive or negative. Measured values of Kow for organic chemicals have been found as low as 10-3 and as high as 107, thus encompassing a range of ten orders of magnitude. In terms of log Kow, this range is from -3 to 7. 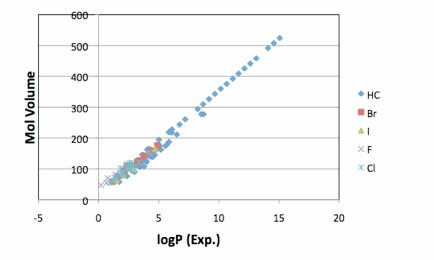 It is frequently possible to estimate log Kow with an uncertainty (i.e., method error) of no more than 10.1-0.2 Iog Kow units. The octanol/water partition coefficient is not the same as the ratio of a chemical's solubility in octanol to its solubility in water, because the organic and aqueous phases of the binary octanol/water system are not pure octanol and pure water. At equilibrium, the organic phase contains 2.3 mol/L of water, and the aqueous phase contains 4.5 X 10-8 mol/L of octanol. Moreover, Kow is often found to be a function of solute concentration. The chemical in question is added to a mixture of octanol and water whose volume ratio is adjusted according to the expected value of Kow. Very pure octanol and water must be used, and the concentration of the solute in the system should be less than 0.01 mol/L. The system is shaken gently until equilibrium is achieved (15 min to 1 hr). Centrifugation is generally required to separate the two phases, especially if an emulsion has formed. An appropriate analytical technique is then used to determine the solute concentration in each phase. 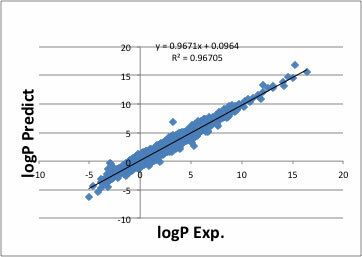 A rapid laboratory estimate of Kow may be obtained by measuring the retention time in a high-pressure liquid chromatography system (If interested in retention time prediction refer to this article); the logarithm of the retention time and the logarithm of Kow have been found to be linearly related. In recent years the octanol/water partition coefficient has become a key parameter in studies of the environmental fate of organic chemicals. It has been found to be related to water solubility (I checked my logS prediction function with endocrine disrupting chemicals), soil/sediment adsorption coefficients, and bioconcentration factors for aquatic life. Because of its increasing use in the estimation of these other properties, Kow is considered a required property in studies of new or problematic chemicals. Values of Kow can be considered to have some meaning in themselves, since they represent the tendency of the chemical to partition itself between an organic phase (e.g., a fish, a soil) and an aqueous phase. Chemicals with low Kow values (e.g., less than 10) may be considered relatively hydrophilic; they tend to have high water solubilities, small soil/sediment adsorption coefficients, and small bioconcentration factors for aquatic life. Conversely, chemicals with high Kow values (e.g., greater than 104) are very hydrophobic. If you are interested in VOC compounds properties estimation (logKow, logS, logBCF, so on), please refer to this article. If you want to design surfactant, logKow play very important role. Not only octanol, you can understand liquid-liquid extraction with this article. Octanol/water partition coefficient is very important index in Biological,toxicological and environmental area. The human body is made from water and lipids. If you know the distribution ratio of the chemicals to the octanol, you can estiamte bio accumulations. But this index is just ratio, and that is problem. 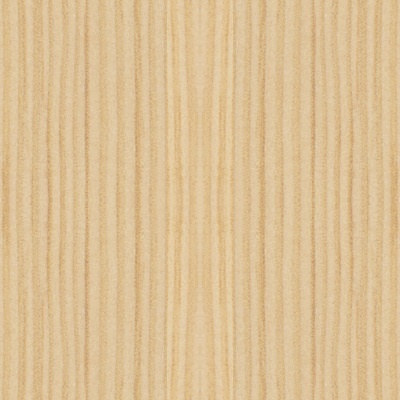 100/100 or 0.01/0.01 logP become same 0. And octanol dissolve to water and water dissolve t octanol, so some chemical that have surfactant nature, the experimental value of logP is not accurate. 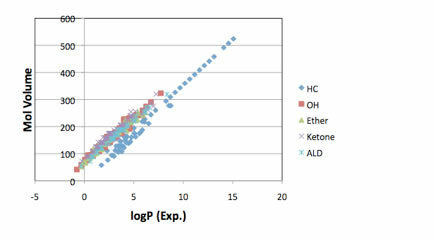 There are many free or commercial software that calculate logP from chemical structure. But almost all program did not open the scheme and factors. I build functional group base neural network to predict logP and put it on pirika site. 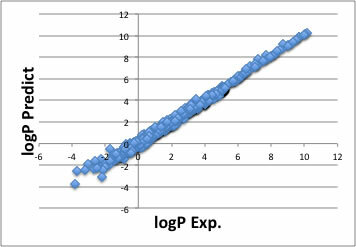 I used 741 compounds' experimental logP data and the result is like below. The area logP is large, the accuracy is very high. But the area logP<0 the accuracy is not so high. In that area, emulsion happen and hard to separate. I always wonder why I can estimate logP with this simple group additivity method. 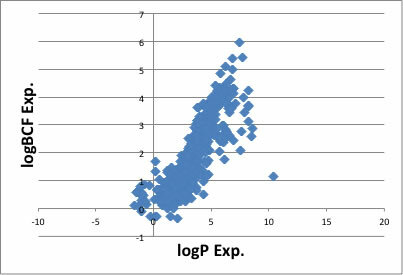 When I was developing QSPR model to predict logP, I happened to plot logP vs molecular volume. 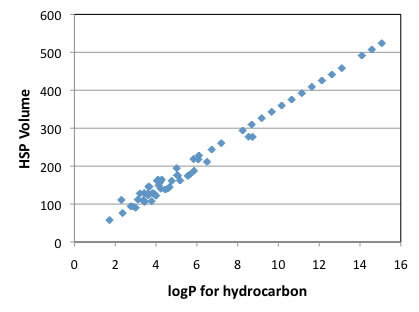 There was very beautiful correlation for hydro carbon compounds. So, I checked other compounds. If there are several haloganeted atoms in the molecule, logP is also determined by only Volume. Br or I have very large volume, though if I plot them with volume, the line is same with hydrocarbon's line. The F atoms are thought to be hydrophobic nature, even though logP is governed by molecular volume. If I polt oxygen containing molecule such as alcohol, ether, ketone and aldehyd, the line is above hydrocarbon line, but it is parallel. I've thought alcohol compounds are easily dissolve water so logP become lower value, but it is not like that. alcohols are easily dissolve to water but it also dissolve octanol. As the result, the ratio become same to other oxygen containing molecules. You can read other compounds result with this article. logP can be predicted with type of molecule and its volume, so group additivity method can predist very effectively. I determined scheme with 5692 compounds and implemented it YMB simulator. By the way, logBCF(Bio Concentration Factor) is believe to have correlation with logP. logBCF is very important index for environmental assessment.